James and I had purchased the Flour + Water: Pasta cookbook by Thomas McNaughton a number of years ago. Somehow I think we thought it was about making bread which is something that we would occasionally do at home. As you can obviously see this book is about making pasta. At the time we did not own a pasta machine so this book sat on the shelf for awhile. One afternoon a couple weeks before Easter I was on the treadmill at the gym and the Chew was on the TV. I find that there is something therapeutic about watching a cooking show while working out. Anyways, Michael Symon was making this bacon and egg yolk ravioli. And I thought to myself, we need to make this for Easter dinner. James is always trying to think about how we can have a holiday dinner and not eat the same food that everyone has come to expect. So I was thinking bacon = ham = Easter. And since we had planned on hosting my family this would be a fun activity for everyone to enjoy since none of us had ever made pasta at home before. For our Easter ravioli we combined the filling recipe from Michael Symon with the dough recipe from Thomas McNaughton. Both of them are posted below. During this process we learned a couple things that I thought we would share with you. 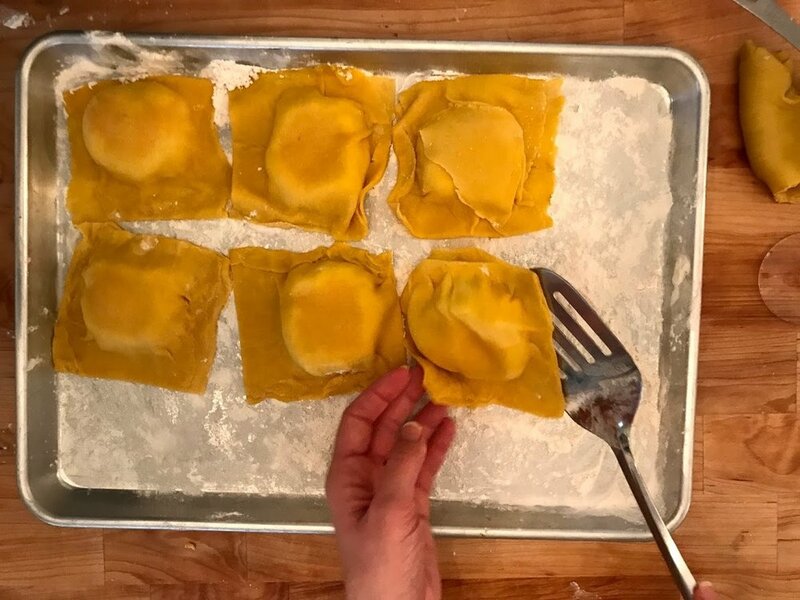 We picked a very complicated ravioli to make for our first try. While we think it was successful, it probably could have been a little easier. Make sure you do the math and have enough eggs. We planned on making a double recipe and it called for over 30 eggs. When making a double recipe it might be easier to make the dough in two individual batches. We tried to make it all at once at it was a lot of wet ingredients to mix into the flour well for a couple beginners. We made these ahead of time and kept them in the fridge covered in plastic wrap. The parts of the dough that was over the egg became very moist and some of them stuck to the plastic. It would have been helpful to give them an extra dusting of flour or make cover them with a towel might have helped. Make sure everyone is helping and have champagne on hand! 1. Place the flour on a dry, clean work surface, forming a mound about 8 to 10 inches in diameter at its base. Sprinkle the salt in the middle. Using the bottom of a measuring cup, create a well 4 to 5 inches wide, leaving 1/2 inch of flour at the bottom. 2. Slowly and carefully add eggs, yolks and oil into the well, treating the flour as a bowl. Using a fork, gently beat eggs without touching the flour “walls” or scraping through the bottom. Still stirring, slowly incorporate flour “walls” into the egg mixture, gradually working your way toward the outer edges but disturbing the base as little as possible. Once the dough starts to take on a thickened, pastelike quality (a slurry), slowly incorporate the flour from the bottom. 3. When the slurry starts to move as a solid mass, slide a spatula under dough; flip it and turn it onto itself to clear any wet dough from the work surface. With your hands, start folding and forming the dough into a single mass. Use a spray bottle to generously and constantly spritz the dough with water to help glue any loose flour to the dry dough ball. When dough forms a stiff, solid mass, scrape away any dried flour from the work surface. 4. 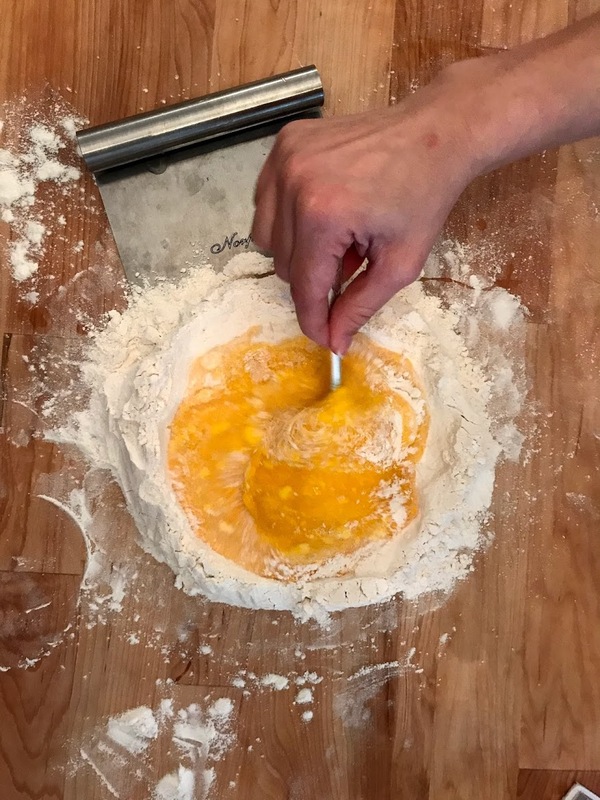 Knead the dough: Drive the heel of your dominant hand into the dough. Push down and release, then use your other hand to pick up and rotate the dough on itself 45 degrees. Repeat for 10 to 15 minutes. This is how Italian grandmas get their fat wrists. When the dough is ready, it will be firm but bouncy to the touch and have a smooth, silky surface, almost like Play-Doh. Tightly wrap the dough in plastic wrap. 6. Rolling out pasta by machine — whether it’s a hand-crank model or an electric one — should be a delicate, almost Zen-like art. Slice off a section of dough, immediately rewrapping the unused portion in plastic wrap. Place dough on work surface and, with a rolling pin, flatten it enough to fit the widest setting of the machine. Roll dough through that setting, guiding it quickly through the slot once. Decrease thickness setting by one and repeat. Decrease and roll once more. It should have doubled in length. 7. Measure the width of your pasta machine’s slot, minus the thickness of two fingers. Make a gentle indentation at the end of the pasta sheet to represent that length. Make that mark the crease and fold the pasta over. Repeat for the rest of the pasta sheet, keeping that same initial measurement. For best results, you want a minimum of four layers. Use a rolling pin to roll it flat enough to fit in the machine. Put the dough back in the machine but with a 90 degree turn, so what was the “bottom” edge of the pasta is now going through the machine first. 8. This time around, roll out the dough two to three times on each setting at a steady, smooth pace, keeping the dough taut and flat. Move on to the next level when the dough slips through without any trouble. 1. For the Filling: Make the filling up to a day ahead of time. 2. Add the ricotta, parmesan, and nutmeg to a medium bowl, and stir to combine. Add filling to a piping bag and refrigerate until ready to use. 3. Cut the pasta dough into two pieces. Take one piece of dough, keeping the other covered, and flatten it with hands. If the dough feels dry, dampen the surface with a few drops of water using fingers or a pastry brush. 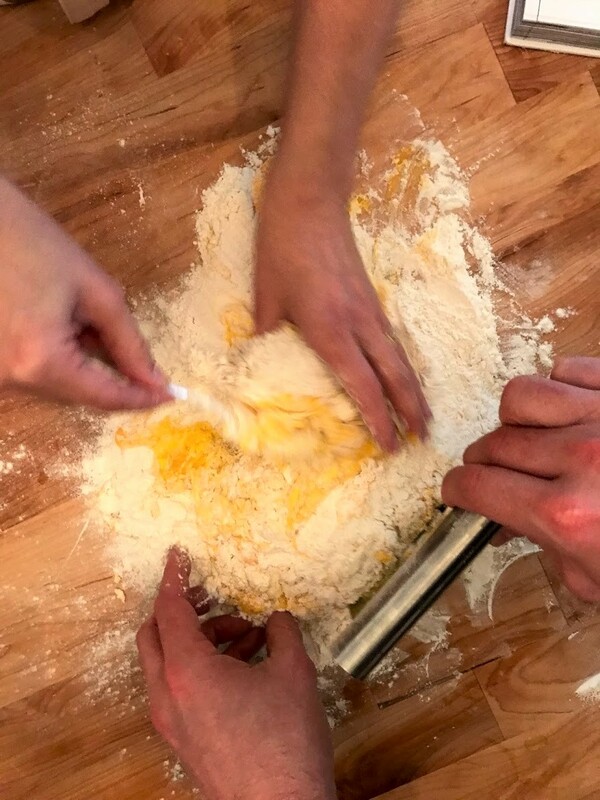 Using a pasta roller or attachment for stand mixer, pass the dough through the widest setting five or six times or until the dough becomes pliable. Repeat the process with the other piece of dough. Continue passing the dough through the pasta machine, reducing the setting with each pass until the dough has reached desired thickness. 4. Lay out the pasta sheets and cut 5-inch rounds. Keep the rounds covered while working with 2-3 at a time. Remove prepared ricotta filling from the refrigerator and pipe filling on one round 3-4 inches in diameter and make an indent in the center to form a nest. Gently place 1 egg in the center of the cheese, then spray the edges around the filling with water. Place another round of pasta dough on top of filling and pinch around to seal, pushing out any excess air. Using a 3 1/2-inch cutter, cut ravioli again, creating a perfect round. Repeat with the remaining pasta rounds and filling, placing the finished ravioli on the prepared baking sheet. 5. Bring a large pot of salted water to a gentle boil, and add the ravioli. Cook until the ravioli are translucent and soft and float to the top, about 3 minutes. 6. Meanwhile, heat a large saute pan over medium-high heat, and add olive oil. Add the pancetta and cook until you render out the fat and the pancetta is crispy, about 6 minutes. Lower to medium heat and add pasta water and lots of black pepper. Remove pan from heat and stir in the Parmesan, then gently add the ravioli along with a drizzle of olive oil. 7.Serve ravioli with some pan sauce and Parmesan on top.